When I saw this scene for myself, in a shallow riverbed—it was breath-taking. I mean, in the middle of a riverbed—beckoning. No, to me, I didn’t see two lonely looking chairs. I saw wonderful possibilities. I was with my eldest son and daughter-in-law. We stopped at this café alongside Highway 1. As I walked closer and closer to the river, each step of the way I became awe-struck. I stood on the riverbed for a little while. Staring at the brilliance. My daughter-in-law decided she needed to cool off, and she walked into the cool, shallow water and sat on one of the chairs. I did the same. Sat, on a chair situated in the middle of the creek. Just amazing! Even though this trip was during a busy 4th of July weekend, for just a few precious moments, no one else was around, I was alone, lost in my thoughts. It was a wonderful feeling. Not a care in the world. Feeling the cool water trickle across my feet, the stress of the work-week was washed away. God has a way of doing that. Right when we need it most. He brings peace within our soul and directs us to a place where there are beautiful wood chairs. I will be going back to that place when it is less crowded. Where I can really be at peace among the Redwoods and sit in a chair in the middle of a creek, that is now flowing wildly from the recent record breaking storms. So, I ask…”What do you see when you look at those chairs?” Does it speak a gentleness to your spirit? Would you like to experience sitting in them, among God’s beauty, surrounded by redwoods? 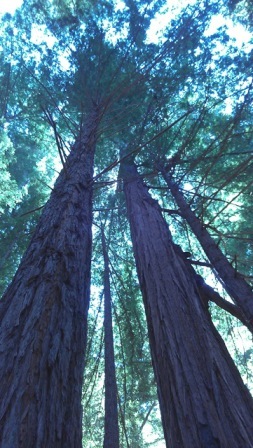 Magnificent redwood trees showing off their huge, yet peaceful, characteristics, reaching to the sky. It’s how I felt. If only you would be able to one day. Karen, It was amazing. You would love it, I’m sure. God bless your day. Ryan, Thank you. Can you imagine sitting there? Yes, Psalm 46 is a favorite of mine. God bless you. Chrissy, you hit another jackpot word with “Godscapes.” I love how you see things! Thank you, Karen! Yes, I’ve used my word, Godscapes for years now. Your encouragement is a blessing. God Bless you. You know how some things leave an impression? That picture was one of them. I’ll never forget the feeling I had when I saw it. It’s hard to describe, but it was wonderful. Wow, Bonnie. I’m so happy you had the same impression as I. It truly was amazing. Sitting in those chairs was too. One day we will go back there. Thanks again for visiting my blog. God bless you. I love to travel and see all the different places God has made. It’s unique in its own way. And all beautiful for different reasons. God is amazingly creative and that too is inspiring. God truly is amazingly creative. He gave us so many gifts to behold. Thank you for visiting my blog. Blessings!